Mopar Chrysler Wings Grille Emblem 05-10 Chrysler 300, Aspen Mopar OEM "Chrysler Wings" Grille Emblem, Mopar 4805988AA Body Emblem, Chrysler 300 Emblem, Chrysler Aspen Emblem, Chrysler 300 Badge, Chrysler Aspen Badge, Chrysler 300 Exterior Parts, Chrysler Aspen Exterior Parts, Chrysler 300 Exterior, Chrys [Mopar 4805988AA Body Emblem] - $79.95 : 3rd Strike Performance, Your Source for Late Model MOPAR Performance Parts and Accessories! 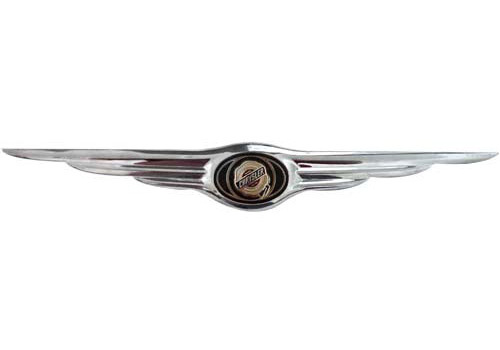 Mopar OEM Chrysler 300 Wings emblem is designed for use on aftermarket billet grilles. This emblem provides your vehicle with that complete factory-installed, professional look. It measures 17.5” long and installs easily with pre-applied, automotive-grade tape. Details count, and this emblem adds a bright finishing touch to your aftermarket billet grille. This Mopar accessory installs easily and is sure to give your car an eye-catching appeal.